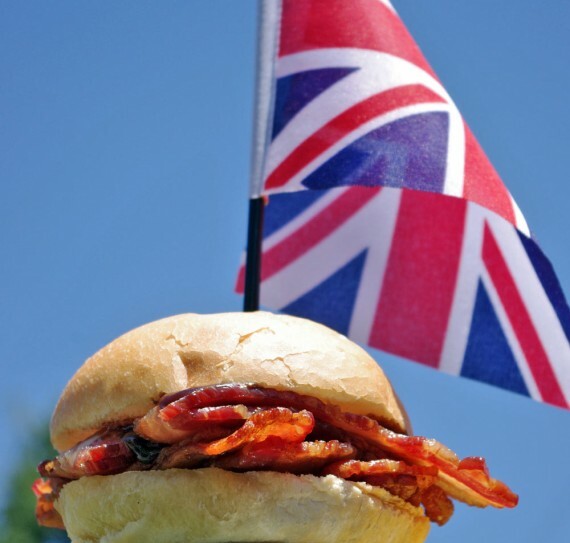 A recent survey revealed that bacon is the overwhelming favorite food of Britain. One in ten Brits put bacon at the top of their list. 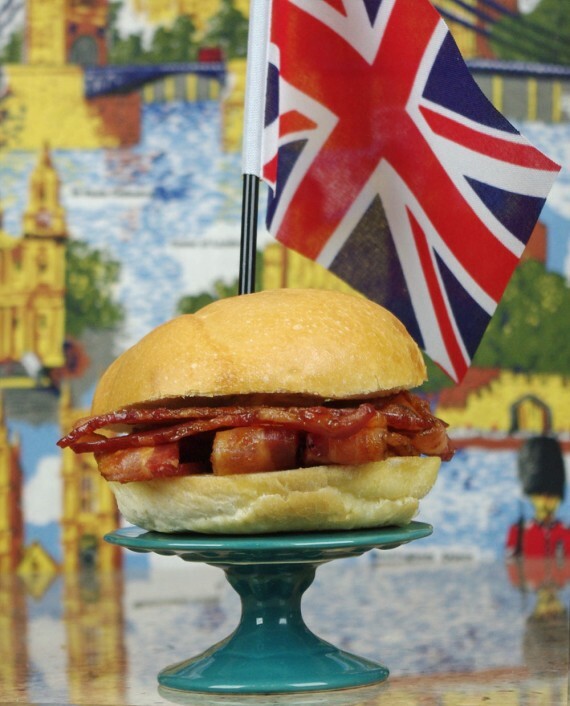 In honor of that great nation of bacon lovers, I’d like to focus on a British staple that’s practically unknown in the U.S., the Bacon Butty – a simple bacon sandwich. When Prince William married Kate Middleton, her precocious brother-in-law Prince Harry planned a post-wedding, wee-hours party with Bacon Butty sandwiches as the main course. 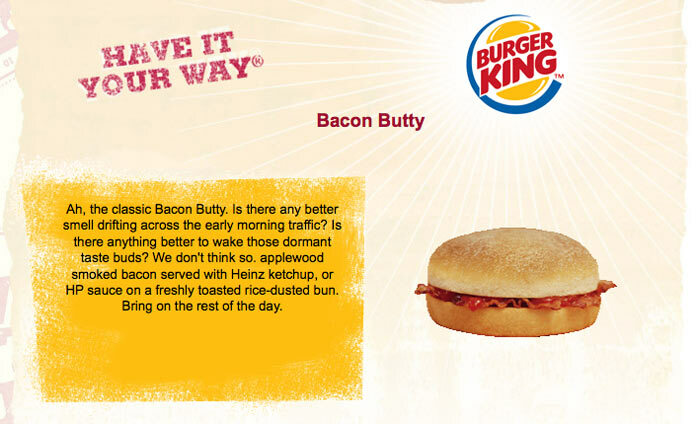 The Bacon Butty is so popular in the U.K. that you find it on the menu of their Burger King Restaurants. 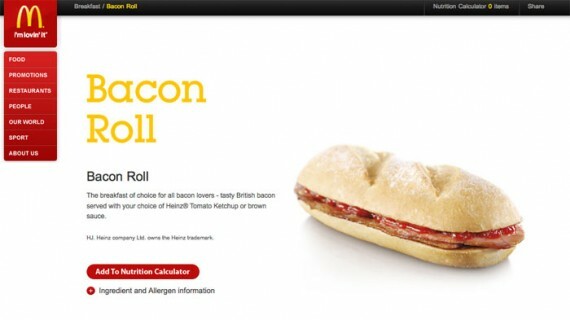 McDonald’s in Britain serve a Bacon Butty, but they call theirs a Bacon Roll. 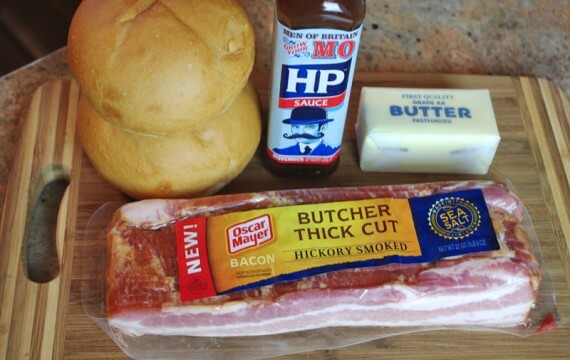 To make a Bacon Butty, select a thick-cut bacon. Bacon in Britain is traditionally thicker than our bacon. 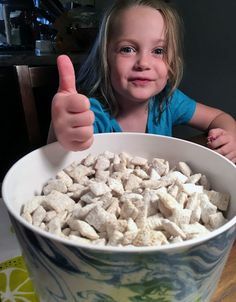 For the bread, I decided to use two over-sized dinner rolls, but you could use any bread you like to make your Butty. Fry up the bacon so it’s completely cooked but still a little flexible. Transfer to stacked paper towels to remove excess grease. 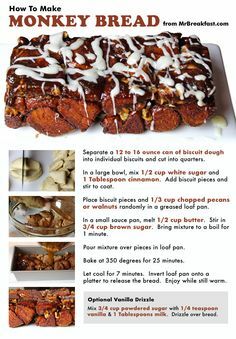 Cut the rolls in half and butter. At this point, many Brits assemble their sandwich. Others fry the buttered side of the bread until browned and crisp. That’s what I did. HP Sauce (aka Brown Sauce) is the most popular thing to put on a Bacon Butty, but A.1. Steak Sauce and regular tomato ketchup are also common. I tried all three and liked the A.1. most of all. I had to visit a British specialty shop to get the HP. 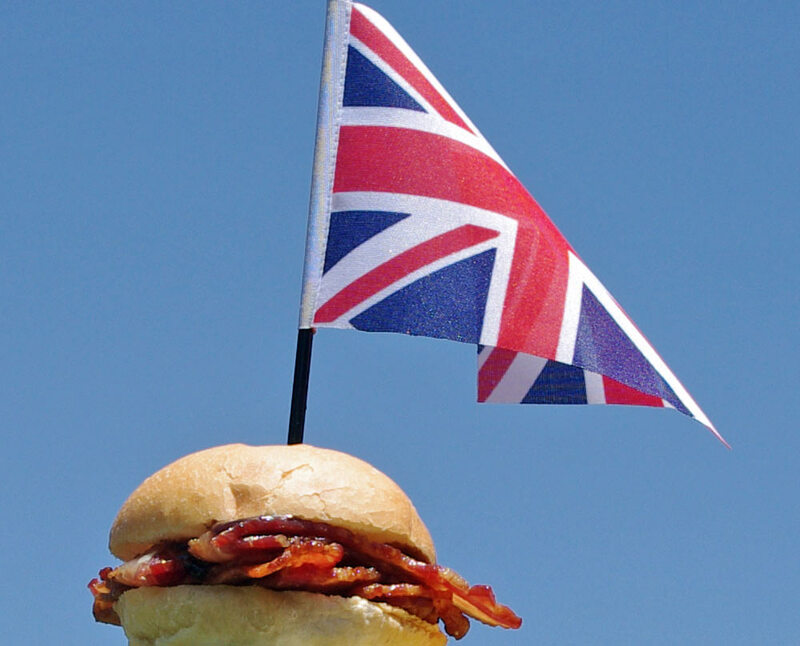 As long as I was there, I picked up a small British flag to act as the perfect garnish for my homemade Bacon Butty. That’s all there is to it. Just pile bacon on your bread. Douse your favorite sauce on top and there’s your sandwich. Now pop that scrummy Butty in your gob. That’s British slang for placing the bacon sandwich in your mouth. That’s a Bacon Butty from your Breakfast Buddy. Enjoy! I’d prefer an addition of a slice of egg or two. British bacon or rashers, is closer to canadian bacon and taken from the loin with some of the fatty part of the belly. Big taste difference. Sweeeeeet Bacon! My sister and I have been making these bacon sandwiches for years! All our friends think we are crazy. We put 10 strips of thin extra crispy bacon (in a cross hatch pattern) between 2 slices of white bread, and it is awesome! It’s crispy crunchy bacon goodness. These Brits got it going on!! As a Brit, in Britain, I just wanted to say that I have never even heard of A1 steak sauce. It’s certainly not common here in the UK. 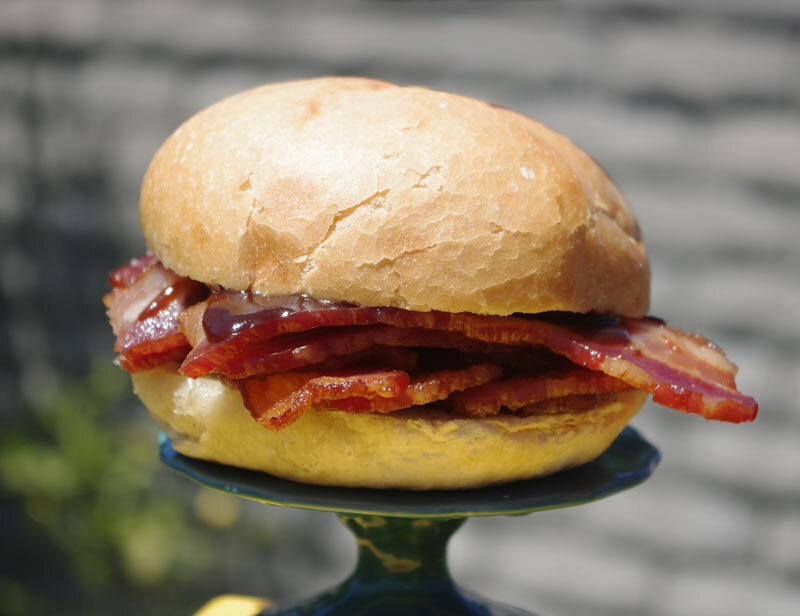 A true bacon butty is made with brown sauce. It’s the law. And a cheeky slice of tomato is also permissible, though obviously that adds a certain healthiness that is somewhat at odds with the entire concept. And I’m afraid to say, my American friends, that you absolutely NEVER drink coffee with a bacon butty. It has to be tea, strongly brewed, with a dash of milk, served in a mug and *not* with the tea bag string still dangling over the edge, thankyouverymuch. And preferably not Liptons. I’d rather just make a BLT and I’ll drink what I like how I like with it thankyouverymuch. I’m a Brit too and I’m afraid I’ve never heard of A1 – Brown sauce or Ketchup are definitely the normal choices so you got that right. I’m a bit unusual in that I like a dollop of sweetcorn relish instead. As Robbie said, our bacon is a lot leaner and most people don’t choose the streaky variety. A lot of people don’t even go crispy though it’s becoming more popular. For the ultimate, golden or crispy thick smoked back bacon between two thick ‘doorstep’ slices of crusty white bread. YUMMY! I’d rather do this my OWN WAY! Add 6-8 SLICES of THICK CUT BACON TO plain,WHITE BREAD! Spread mayonaise on each slice and add to it two FRESH SLICES of TOMATO! Salt and pepper to taste! Add your choice of lettuce! Yeah,it’s a B.L.T! But I’d rather have THAT than the “Bacon Butty” with Brown Sauce! (Give me a BREAK!) Note. If the tomato’s are fresh from the garden,you MAY want to eat your sandwich over the kitchen sink. I’ll take that B.L.T. over the “Bacon Butty” ANY DAY! Exactly! But leave the salt and pepper off mine. It cannot be that streaky excuse of bacon, it cannot be any other sauce than hp Brown sauce, and not on fried bread or with coffee. My parents and three grandparents were Canadian – one was British. We all ate bacon sandwiches on buttered toast (not bread or buns), and with home made chili sauce on the sandwich (our family home made Chili sauce is not like any Asian or Mexican Chili sauce). A poor substitute might be Heinz chili sauce if the last jar of home made chili sauce was empty. Unfortunately, the Heinz variety doesn’t have a kick to it – too much like ketsup. When visiting grandparents in Canada, we always used back bacon for our bacon sandwiches and served it with a soft boiled egg in an egg cup. When in the USA, we used either Canadian bacon or American bacon. I’m almost 80 now and I could eat a bacon sandwich at any meal. 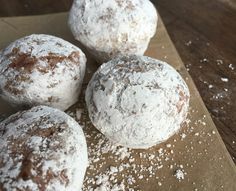 I grew up eating them and I love them. I still eat it on toast, but avoid buttering it. I know what HP sauce is, but I use that when making Shepherd’s Pie on a Monday to use up the leftover potatoes, roast and peas from Sundays family dinner. .
And as another commenter says a bacon buttie must be accompanied by a decent mug of tea, preferably made in a pot. Real tea, with a bit of milk (sugar optional). Yorkshire tea preferably. You don’t mess with this stuff. Oh and what on earth is steak sauce? Never heard of that in Britain! A very dark brown vinegar based condiment with fruit extract and anchovies. It sounds more intense than it is. It works really well to enrich almost any meat. Oi, mate. It’s not OY, it’s oi! British, not Jewish, oy. And just what is brown sauce besides…brown? Is it tomato based? Meat based? Vinegar based? it’s both. It’s fruit and vinegar and vegetable based, cooked and pureed. Basically a sieved chutney. Whats wrong with a good old american BLT. I love bacon and blt’s are my favorite! Isn’t it called a bacon BUDDY? It’s funny Brits only seem to have one sauce over there (HP) other than Heinz (ironically American ketchup). We have so many sauces here across the pond to choose from. I do have HP here (I took a liking to beans on toast but Heinz beans from the UK need a little something added (Vindaloo sauce also works well with some mango chutney spread on the buttered toast) along with some proper English cheddar (or Irish; it’s not always easy to find English cheddar at all American stores; no American cheddar I’ve tried tastes anything like cheddar from the British Isles). I’ve played with other cheeses and beans but they’re really not the same (Heinz American vegetarian beans are OK if you can’t find the UK ones (Giant Eagle has them though) but they already have some spices added that change the flavor). 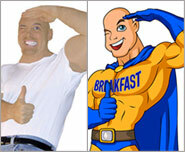 Still good stuff (for breakfast or any time of day) and no artery clogging bacon needed. Muenster cheese was interesting with the Heinz American beans although I’m sure the Brits would find that heretical (probably why they only have one sauce as well). I mean salad cream? Really there are more salad dressings out there and not everything has to be made by Heinz…. I am not going to pay $15.00 a bottle for HP (Brown) sauce, but I found a Barbecue sauce with most of the same ingredients. I may buy one bottle to compare it and a home made version with the HP sauce, just the packets. And I am going to make it with American bacon and Canadian bacon and kaiser rolls. 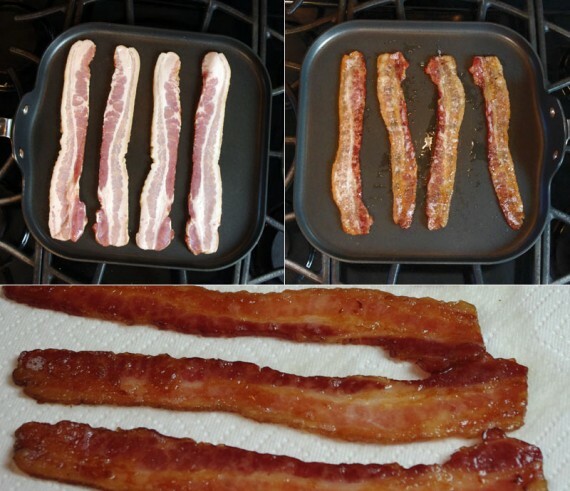 Two kinds of bacon… sounds great. Let me know how it goes. Would love to know what that BBQ sauce is that you’re talking about. $15? Where does it cost $15? HP Sauce is more like $4 (I’ve got two bottles in the fridge at the moment, one regular and one “fruity”) and I’m in the US. 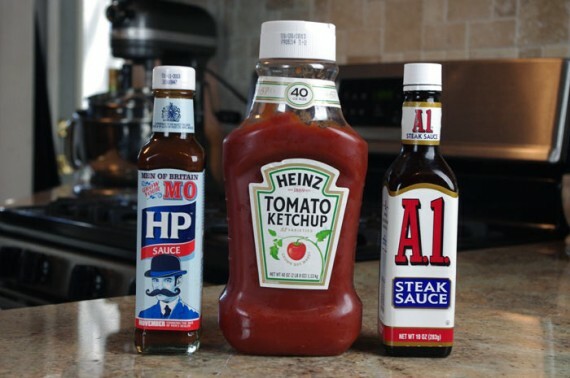 A-1 Sauce (different flavor) also originates originally from Britain and is even older than HP. Sure eat those and look like Onslow. ROFL. Even better than HP is Daddies Sauce- it’s called favourite for a reason!